Since poor Uncle Matt was in Saudi Arabia for 4 weeks we were very excited to get to finally see him and celebrate his birthday. Aunt Erin made us all a great dinner and a birthday cake. 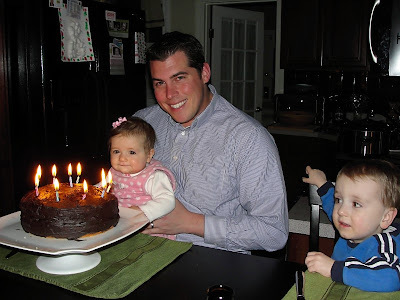 Happy Birthday Uncle Matt - glad you are back. You need a new job! As you can tell, Angela LOVES her godfather. Since Daddy was away for the weekend skiing with his friends, Babci came for a visit. 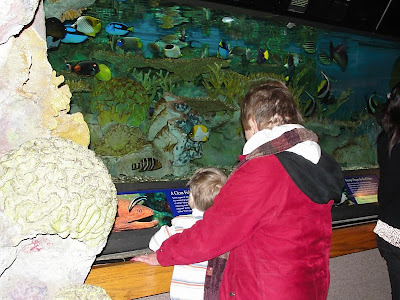 Richie had been sick for a few days so it was nice to finally get out of the house and get to the Aquarium. Although it was freezing out, we made it there and were nice and toasty watching all of the animals. Angela was much more engaged in what was going on this trip as well. AND, luckily Nemo is "better" (his tank was under construction) so we had a very happy boy. 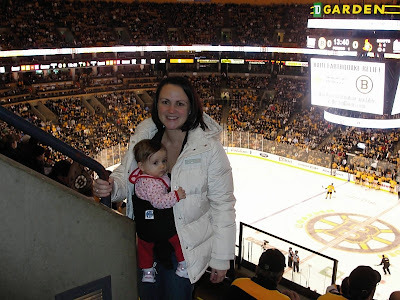 Angela went to her first Bruins game! We bought a 10 game pack this year, but she had not come with us yet. This was a weekend afternoon game so all 4 of us went. The kids actually did great. Angela slept for part of the time (through the really loud noises of a hockey game) and Richie held it together even though he didn't get to nap. He did cry the first time the other team scored. 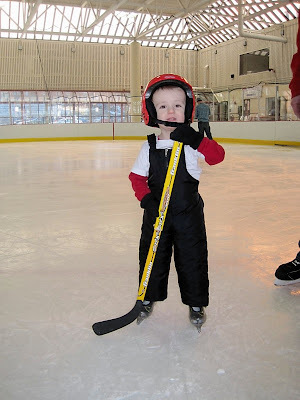 We will have to toughen him up if he is going to be a hockey player! So on top of all of the parties, cupcakes, friends/family and presents Richie's actual birthday finally rolled around so we had another reason to celebrate! He woke up to presents and homemade corn muffins. Then I presented him with lots of ideas of fun things we could do that morning. He chose to stay in his pajamas and watch Toy Story 2. When asked what he wanted for his birthday lunch he said McDonald's.....oh just wait, it gets better! After nap we went bowling (for the first time) and for his birthday dinner.......Redbones (ribs)!!! All things he is rarely allowed to do. Just wanting to spend a lazy day on the couch eating fattening foods.....obviously my son! HAPPY THIRD BIRTHDAY my precious little booper pants!! I had to sneak this picture in because we were all so busy we didn't notice Angela was swiping french fries off of the table. Needless to say, she loved them! When you are 3 you actually enjoy getting older and celebrating your birthday. 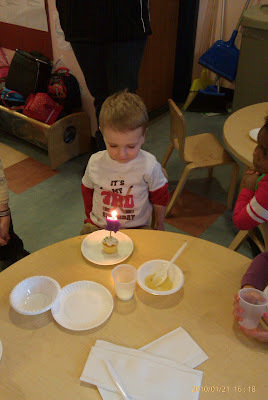 So in the spirit of celebrating with everyone we knew, Richie also had a birthday party at school. He got to wear his "birthday jersey" again and have cupcakes with all of his friends. His favorite teacher Rachel was there to help. Best school buds Jackson and Kai! Richie was the luckiest little boy because he had a HUGE 3rd birthday ice skating party. I don't think there was any detail we missed. Most of his friends were there (and some family of course), he was able to ice skate AND play hockey. Adding pizza and cake just made it even better. Even the big kids (Moms and Dads) were enjoying the rink. 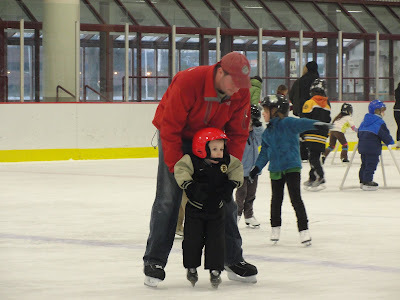 The best part for me was seeing him skate all by himself. He was the best one out there! Thanks to all of our family and friends for making this such a wonderful party. You only turn 3 once! Jakie, Josh, Colton, Riley, Brayden, Liam, Maddie, Ainsley, Sammy, Adelle, Maddie, Haley, Maggie, Lucie, Emma and Molly. 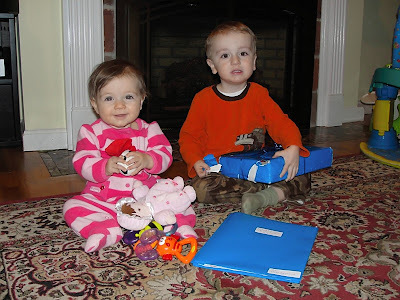 There are so many firsts in a kids life, but for some reason this first was the hardest for me. My first baby was out by himself on the ice. Yes, I shed a tear....or two. I don't even know if I can explain how well he did. Although a little apprehensive getting onto the ice and leaving Chris at the door, he did it. Went right onto the walker and then the teacher let him go. Let go......let go.......he hadn't really been happy before when we let go and today it took him 30 seconds. The best thing we did was sign him up for lessons because he progressed quicker over these 45 minutes than he did with us over the past few days. He learned how to fall and how to get up. At this point Chris and I are amazed at how far he has already come. THEN the teacher pulls the walker completely and he skates on his own. Just like that! 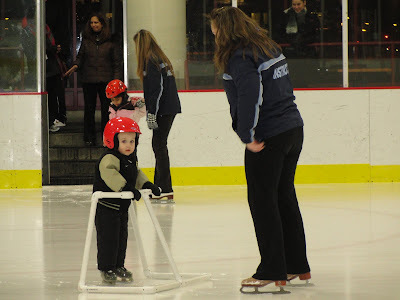 We had an awesome work event where we were able to bring our families ice skating! Richie is really improving. 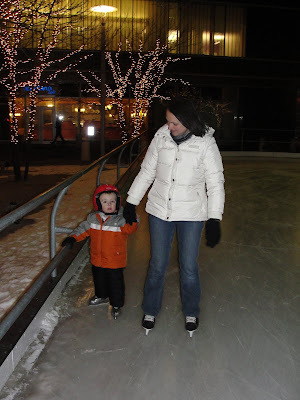 It was actually a beautiful night (not too cold for once) and lots of fun to skate outside. I think Richie's favorite part was that Jennifer was there. 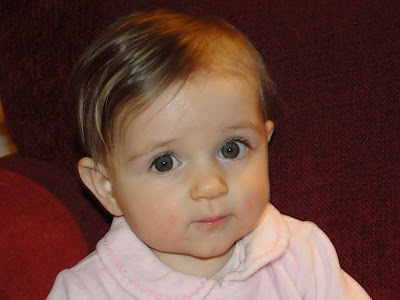 She is Gayle's (my boss) daughter and his friend from school. Can a 2 year old have a true passion?? Well regardless, Richie is obsessed with hockey so ice skating is a lot of what we spend our time doing. Here are some of his moves on the ice. Chris might be a little tall for this practice. He is into though. He bought himself skates! This video is pretty self explanatory! Just the kids playing and singing together. SO CUTE! We had a fun Friday with not one but TWO playdates! In the morning we went to the Foster's house to play with Emily and Gracie. 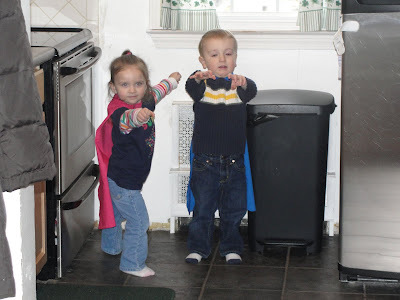 As you can see the kids enjoyed pretending they were superheros with the girl's capes. At night, the Revette's came over. We loved listening to Rock Star Lucie play the guitar. My precious, beautiful, drama queen, angel is 7 months old!! Richie at 7 months. Oh he was such a great, happy baby. I can't believe that was so long ago. With all of the snow we have been getting, we made a crazy decision to get out of the house on the last day of vacation to hit Edaville Railroad for the Festival of Lights. It was a trip we had been trying to plan with Kelley (thanks for the tickets!) for the few weeks before Christmas, but it never happened. Today was the last day it was open so we just made it. We were also lucky enough to go with our friends Colton, Riley and Brayden. 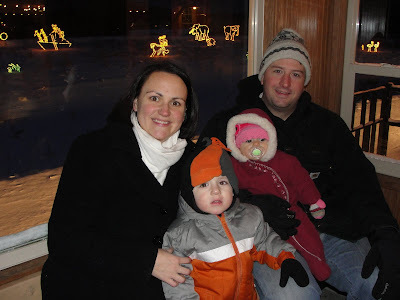 It was the perfect winter evening with a trip on the train to see the lights, some rides and dinner in Plymouth. A little strange to be at an amusement park in the cold and the snow...but hey, little kids never seem to be bothered by the weather. We had a wonderful, relaxing new years holiday. Not sure how we are going to go back to work because we have spent so much family time together, no one is going to like getting back into the grind. On new years eve we had an adult dinner once the kids went to bed. After that we rented a movie and stayed awake until midnight! Then we went outside to watch the fireworks that were over the harbor which we could see from our roof. And in bed by 12:15. Couldn't have asked for much more. One new years day we went to Aunt Erin and Uncle Matt's house for dinner. 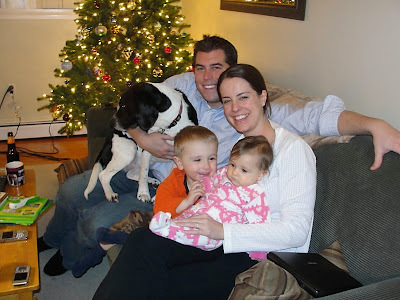 Although we had a year we will never forget, we look forward to 2010 and all that it has in store for our new family of 4 (or 5 with Regina!). Love, health and happiness in the new year to all of our family and friends.